Lately I’ve been binge reading books and articles about both Anne Boleyn and her daughter Elizabeth. With Anne Boleyn it can be easy to burn out on her, especially during the month of May. Everywhere you look there is another post or image of her and discussion of her unjust execution. In the past, a majority of the stuff I read about Anne had to do with her time at Tudor court, so I was excited to have the opportunity to read about time in Mechelen. The day before her death, Anne Boleyn remembers a journey that changed her life. She recalls how, as a young girl, she used her wits to secure a place at the prestigious Court of Margaret of Austria, where she soon realised that a woman had to be strong to survive the treachery of Court politics. And she came to understand that she must shape her own destiny if she was to be happy. It is here that she met the young man who would one day make her his Queen. However, loathing his hateful boasting, this girl had plans of her own, and she was determined to impress her ambitious family. Anne Boleyn’s life was one that ended tragically. It refreshing to read about her “living”. One thing I’ve often wondered is why, at 13, was Anne sent to Mechelen and the court of the Regent, Margaret of Austria and not her older sister, Mary? Mary should have been sent well before Anne. In the research I’ve done I have often come across the thought that Anne was a better student than her sister and her knowledge of the French language is the reason she was sent in Mary’s place. But, in this book, we see that being used as the excuse only to cover up what really happened. I don’t want to spoil it for those who have not read the book. Once in Mechelen, the Anne Boleyn we know today began to form. We read of a girl, who looks young for her age, who gradually grows into a young lady. Anne is eventually shipped off, by her father, to France and the court of Mary Rose Tudor who had recently wed King Louis. There she would serve with her sister Mary Boleyn. It was interesting to read about Anne’s constant curiosity and gossiping that would get her into trouble; Yet she still became a favorite of Margaret of Austria who over time would request Anne to read to her or play the lute for her. In this story Richards also introduces Henry VIII into Margaret of Austria’s court and his relationship with her and her father, Maximilian I, Holy Roman Emperor. Also included is Charles Brandon’s flirtatious nature with Margaret and how Anne and others perceived it. The story ends with Anne bidding farewell to her friends and her lady in Mechelen, riding away holding onto her dear memories of her time at the court of Margaret of Austria. The author did a marvelous job researching the life of Anne. Throughout it I recognized pieces of historical fact intertwined with the marvelous story telling of Richards. It was refreshing to see a part of Anne’s life that we don’t often explore. I would rate this book 5 out of 5 stars! ← Anne Boleyn’s Dog Purkoy: Where Did He Come From? 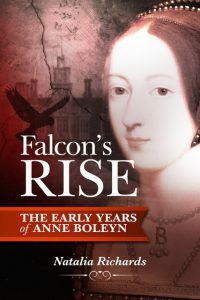 Hi Tony, Yes indeed, and you can read all about what happened to Mary and Anne in my next novel ‘Falcon’s Flight’. I’m busy writing it now!